An inept adventurer has awoken the draugr of a mysterious barrow in Wrothgar. Draugr from a nearby barrow harass the Orcs of Gloorot's clan. A legendary hero named Narsis Dren agreed to help them, but he has yet to return from the ancient barrow. Speak to the adventurers outside Exile's Barrow or the Orcs in the nearby village. Rescue Narsis Dren within the barrow and find the central chamber. Explore both wings of the barrow to recover tablet pieces and investigate the four engravings. Repair the tablets in the central chamber and activate them in the same order as the engravings. Decide the fate of Dren, and return outside for your reward. The sequence for the lock is the order of the events depicted in the panels (Triumph, Exodus, Restoration, Ascension). Once in the treasure chamber, you have a choice on how to handle Narsis. You can trick him into a sarcophagus, and leave him as you originally found him, or you can order him to confess to the villagers. If you order him to confess, he dashes off ahead of you to tell them how awesome he is. You find him on a stage telling a heavily edited tale of his heroism involving lightning reflexes and two daggers, which he hastily pauses once you approach. "We did good work today, my friend! You should be proud! Now if you'll excuse me, I have to finish my tale and then accept compensation from my adoring public!" That's quite a tale you were telling the village. "Every story needs a little embellishment. Surely you've read my books? I know how to hold an audience's attention!" I can't believe you're going to profit from this when it was all your fault. "The draugr dilemma? That was an unfortunate accident. But I acquired a rare dragon priest mask. And the draugr have begun returning to their slumber. All thanks for my efforts. And with your help, of course." Now you can persuade him to give the villagers some gold in compensation, or ask him to tell Mazgroth the truth. [Persuade]You got the dragon mask. These poor villagers deserve some gold for the trouble you caused them. I think Mazgroth deserves to hear the true story of what happened in that barrow. "Very well, if you insist. But it won't make any difference, do-gooder. My version of the tale is more exciting. You're just going to come across as petty and jealous. Now off with you. And don't expect a mention in my next book." Mazgroth is nearby, and takes the news in stride. "Welcome back. Let me guess. From that look on your face, Narsis Dren wasn't completely honest with us when I hired him." Not completely. He accidentally disturbed the draugr while he was exploring the barrow. "I knew his arrival in the village right after the draugr appeared was a bit too convenient. I've seen his type in my travels. Arrogant, sneaky, but mostly harmless. Probably had you do all the hard work, too." With the dragon priest dealt with, the draugr should go back to their rest now. "I suppose Narsis Dren helped us, after all. It's no small feat when a wind filled Dark Elf actually accomplishes something. We call that a "little victory"." At least he dealt with your draugr problem. "A problem he created! We could deal with a few draugr, but we try to avoid constantly fighting with our neighbours. Here. Since I'm sure you did all the work, take the gold I was going to pay him." You can find Narsis Dren's journal while exploring the barrow, which reveals that it is his fault the draugr have awakened. You can confront him about it in dialogue after finding the journal. If you choose to leave Narsis locked in the sarcophagus, he will comment on it during the quest Ancestral Adversity on Vvardenfell. 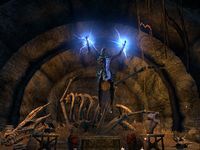 Upon entering the treasure chamber, Narsis Dren may become un-interactable, making it impossible to progress the quest. Logging out and back in fixes the issue. I need to go to the old Nord barrow and check on the treasure hunter named Narsis Dren. I should look for him in the barrow at the top of the hill. Narsis Dren believes we can find a way to return the draugr to their rest in the barrow's main burial chamber. He wants me to lead the way as we search for it. Objective: Find the main burial chamber. Inside the antechamber, we found a large, impressive door that must lead to the main burial chamber. Maybe Narsis Dren has an idea about how we can open it. I should talk to him. Objective: Talk to Narsis Dren. Narsis Dren thinks that we need to solve a puzzle lock to open the door to the main burial chamber. But three of the stone panels are broken. We need to find the missing pieces of the panels before we can attempt to solve the puzzle. Objective: Find East Barrow pieces. Objective: Find South Barrow pieces. Objective Hint: Ask Narsis about the bas-relief. Objective Hint: Find the missing panel piece. We have the broken puzzle pieces. Now we need to solve the puzzle lock to open the doors to the main burial chamber. Perhaps Narsis Dren has an idea about how we should proceed. Objective: Unlock the main burial chamber. Objective Hint: Fix the broken panels. Objective Hint: Press the panels in the proper sequence. I should follow Narsis Dren through the door and speak to him on the other side. Now that we entered the ancient tomb, we should see if we can find a way to end the draugr dilemma. Objective: Explore the main burial chamber. I defeated the ancient dragon priest of the barrow. Narsis Dren grabbed something and ran off, yelling about a treasure vault. I should catch up to him. Objective: Follow Narsis to the treasure vault. Narsis Dren led me to the treasure vault, which was likely his goal all along. I should speak to him. (If chose to let Narsis confess) I should talk to Narsis Dren and convince him to tell the Orcs the truth about Exile's Barrow. I should return to the village and let Mazgroth know what Narsis Dren did. He may have caused the draugr problem, but at least he helped me fix it in the end. This page was last modified on 28 February 2019, at 14:32.